Dakar 2019 heads into its final day on Thursday following a cracking 312km bash through the dunes around Pisco Wednesday, leaving just 112km of racing in the epic ten-day race. The car, truck, quad and side-by-side races are all but run, but the motorcycle race will go down to the wire and things are looking up for several Southern African cars and competitors. Toyota Gazoo Racing’s Qatari Dakar specialist Nasser Al Attiyah’s proudly South African Hilux took a three-quarter of an hour lead into the day’s stage with former multiple Dakar bike winner Nani Roma’s Mini and world rally legend Sebastian Loeb split by 16 seconds behind as crews blasted into the treacherous loop across the sand and dunes around Pisco with four cars starting together in waves five minutes apart. Loeb made short work of Roma as he drove off into the distance, opening a sizeable gap as Mini drivers, Pole Jakun Przygonski and Frenchman Cyril Despres, Al Attiyah and Toyota Teammate, SA Dakar hero Giniel de Villiers gave chase. There was drama behind when frontrunner, Frenchman Stephane Peterhansel stopped and retired from the race after co-driver David Castera suffered severe back pain, while teammate Carlos Sainz and Dutch Toyota driver Bernhard Ten Brinke did not start. There was more drama as Loeb ground to a halt late in the stage, losing 20 minutes in the process, leaving the tussling Despres and Attiyah, albeit racing a quarter-hour apart, to scrap over the stage win but it was Attiyah who took the day again as Despres lost 30 minutes sin the last sector, leaving Roma to finish second ahead of de Villiers and Pole Przygonski’s Mini as Al Attiyah consolidated his commanding lead to 51 minutes with just a short stage left to run as de Villiers made up a couple of positions to 8th overall too. It was a tough day for the South African contingent when rookie heroes Shameer Variawa and Zaheer Bodhanya bowed out of the race on Tuesday when their SVR Red Lined Nissan Navara struck a hidden rock in visibility, severely hampered by a combination of thick fog and fesh fesh on a tricky section early in the day, to cause enough damage to prevent them from completing the stage. The intrepid duo had done well to overcome a series of challenges throughout the race. 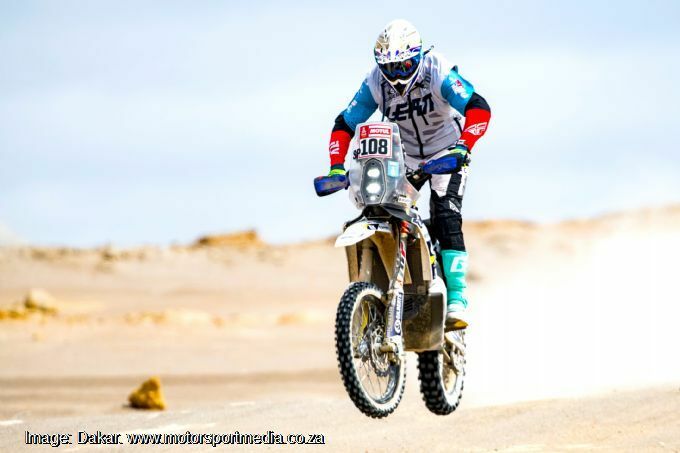 Another SA competitor to show ultimate grit over the past eight days, Original class bike racer Stuart Gregory’s Dakar also came to an end Tuesday. The Port Edward adventurer who was racing without any service assistance out of a trunk carried from stage to stage in a truck and containing all his spares and tools, suffered the despair of an engine failure on his KTM to end a debut typified by a consistent run throughout. Southern Africa’s two wheeled rookie heroes, Botswana rider Ross Branch and his KTM and Husqvarna-mounted Kenny Gilbert from Pretoria, both of them multiple SA champions meanwhile enjoyed another positive day around Pisco as rookie leader Branch rode home 15th for the day to move up to a brilliant 13th overall and Gilbert arrived to shift up to overall as he remained third among the 2019 rookies. It was fraught at the head of the motorcycle leaderboard as British KTM rider Toby Price started the day just a minute clear of Chilean Pablo Quintanilla’s KTM, with the top four including Austrian KTM reigning champion Matthias Walkner and Adrian van Beveren all within just ten minutes after eight days of racing as the bikes set off in waves of ten machines at a time. Dominant Argentine quad leader Nicolas Cavigliasso continued to dominate the quads, while Chilean Francisco Lopez Contardo led the side-by-sides by an hour, but there was drama among the trucks on Tuesday as erstwhile leader Russian Eduard Nikolaiev (Kamaz) lost an hour and teammate and countryman Dimitry Sotnikov took the stage win to move into the overall lead, while SA crew man Sean Berriman’s MAN was up to 11th.